I was bought this bundle of Soap & Glory goodies for my birthday. 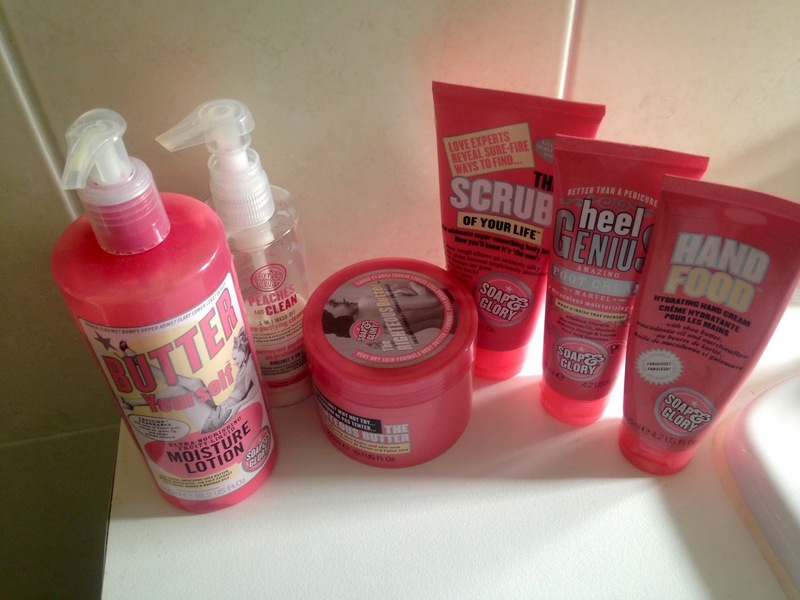 I love Soap & Glory and find their products delicate on my skin and divine in smell. My most used product is the Hand Food, I use it every day. It helps hydrate my skin and rids me of the dry skin brought on by the weather change. Unlike other hand creams, this particular one is non-greasy, smooth and smells lovely. The Heel Genius is also another product that I would recommend. Since the summer, I have suffered from slightly cracked skin on the heels of my feet. I used this over night after a shower and wear cotton socks so that the cream can soak into my skin. It works like a charm. It has really helped over the weeks and I try and use it at least once a week to keep my feet in good condition. Peaches and Clean is not one of my favourite products, It doesn't work well on my skin. I wouldn't recommend this product if you're prone to oily skin. It only made mine worse and I would end up with an oily sheen which isn't the best look. What I would say is that it smells wonderful. It would be perfect for normal skin. The scrub of your life is amazing, its the best exfoliator I have used in a long while. I exfoliate once a week and my skin is always left extra smooth. Definitely a product to try that is cheap and wonderful. 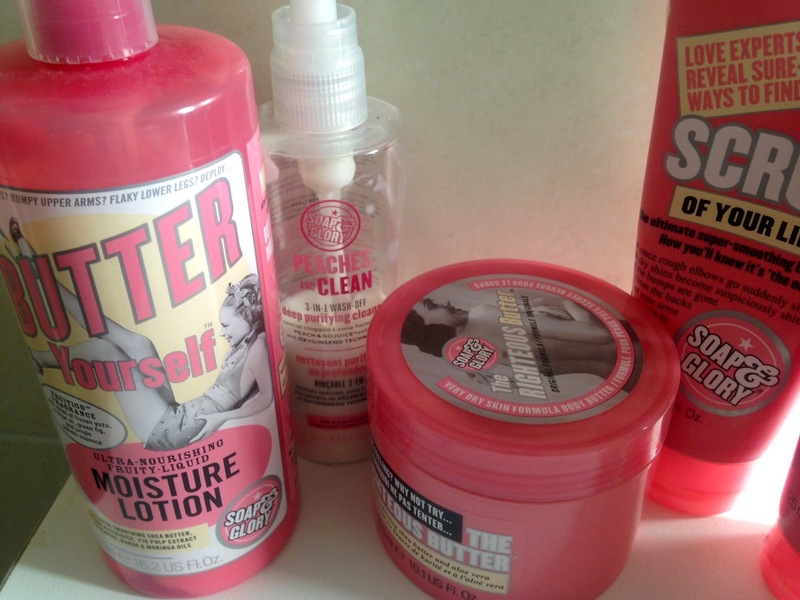 I mentioned the last two soap and glory products in my 'Body Creams collection post' I love these Soap & Glory creams because they smell so fresh and they both work so well on my skin. I use both the moisturiser and body butter depending on my mood. Both smell wonderful, I would describe it as a perfumed scent. As I mentioned before, I prefer the moisturiser to the body butter, however if I am suffering from really dry skin I swap them over as the butter is thicker and I find it rids me of any dry skin.